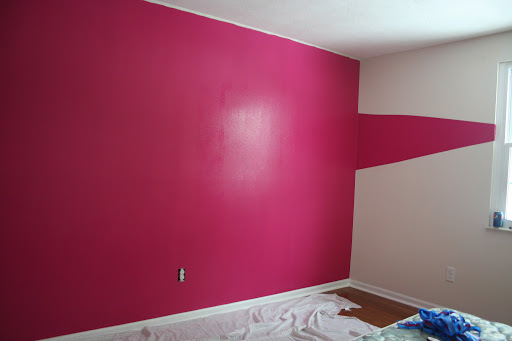 The girls have their rooms painted, mostly. They are still waiting for Dad to trim the ceiling, he doesn’t trust anyone else to do it. He is very picky and does not tolerate paint on the ceiling by accident. Here are the girls painting projects, more to come as we get settled in and they do some more things to their rooms. Behr’s Glam Diva. Kiki spiced it up a bit by putting what she calls a “sunset ray” coming from the window. I tried to get her to do something all around the room but this was what she invisioned. 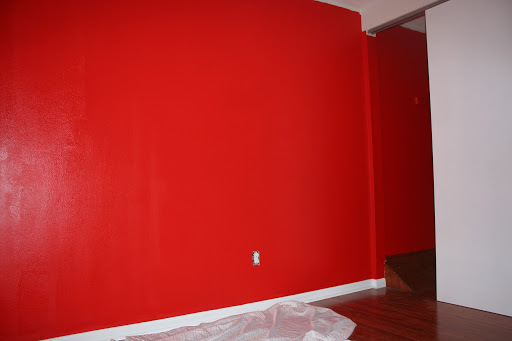 Behr’s 100 MPH Red on one wall into the closet wall which will be were her closet shelving will go so when she pulls her bins from the shelf, she will see her red paint.